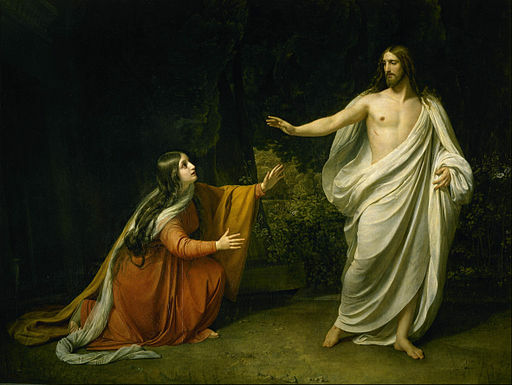 All four gospels agree that Mary Magdalene was the first witness to the resurrection, a not-so-subtle hint as to the importance Jesus placed on women in his ministry. In Costa Rica, celebration of Easter is embedded in the larger event of Semana Santa, or Holy Week. Wednesday, Thursday, and Friday of Semana Santa are national holidays. Many families take the entire week off to travel to the beach or the mountains. Others enjoy their vacation in the city, with friends and family at home. For the faithful, there are processions and services to commemorate the final days of Jesus. The largest procession takes place on Good Friday, a re-enactment of the crucifixion that moves slowly through the streets. The sale of alcohol is banned, but most people get around this by stocking up beforehand. Eating meat is prohibited, but no one truly fasts. Indeed, the daily menu is packed full of seafood delicacies, baked goods, and the like. From a certain perspective, Holy Week might be considered the Costa Rican equivalent of Thanksgiving, in terms of the sheer amount of food put on the table, as well as the cultural emphasis on family gatherings. By Easter Sunday, most of the excitement has died down. As a Hispanic country, Costa Rica embraces few of the northern European pagan traditions that have shaped Easter in the U.S. There are no Easter eggs here, no Easter baskets, and most tragically, no chocolate Easter bunnies. (Of course, we’ve all eaten more than enough paella by Sunday anyway, so it’s probably best to avoid chocolate and jelly beans.) In fact, relatively few people go to mass on Easter Sunday, since the “big” day here for worship is Good Friday. For faithful Catholics in Costa Rica, the culmination of Holy Week is the Good Friday procession, a custom inherited from Spanish conquistadores that commemorates the crucifixion. Though I no longer attend Catholic mass, Holy Week continues to be important for me, spiritually and culturally. My personal reflections this year have centered on a related tenant of the Catholic faith: the Second Coming. Belief in the Second Coming is a tougher challenge than belief in the crucifixion and resurrection. Prophecies are shrouded in mystery and riddle, subject to multiple interpretations. As a result, there have been countless moments in history where people have believed the Second Coming is at hand, only to be disappointed once again. This is just as true now as it was a thousand or two thousand years ago. And if we are to be honest with ourselves, we’ve had multiple apocalypses by now. So, what in the name of Christ, is Christ still waiting for? It’s sad to realize, looking back, that at the tender age of twelve I’d already grown cynical about the capacity of humans to achieve a world of peace, justice, and love. Maybe salvation will come from above, but like Sr. Catherine, I tend to believe the future is in our hands. But as Sr. Catherine’s words percolated through my spirit, I began to understand the power of this belief she professed. What if it were true that the Second Coming depended intimately, wholly, on us? How would it change the way we live, the way we interact with each other, the choices we make on a day-to-day basis? Which path of faith would have more impact: passively waiting for Christ to come again so he can destroy the riff raff and save the rest, or proactively building a better world, brick by brick, so that we can welcome the spirit of God back into our midst? The Second Coming is not Christ’s job, it’s ours. In order for it to happen, we must build a world of peace, justice, and love. We must eliminate poverty, hatred, and bigotry. We must put a stop to greed and exploitation. We must love our neighbor, as Jesus once urged us to do. If we don’t succeed in making manifest the world Jesus envisioned, Christ cannot and will not return. This might be a depressing thought for some, but it puts the challenge right where it needs to be: On our shoulders. Here, and now. As active participants in the journey of faith. Many blessings to all of you this Easter season. May our actions this year bring everyone closer to a world of peace, justice, and love. There was an Abbey here in CT that was…I guess confiscated is the proper word for it. The Sisters there were accused of goddess worshipping, because they thought things like your Sister Catherine. They taught love and venerated the earth, were devoted to Mary, to helping the community. Everyone loved them–their town, the neighboring towns, every down-and-out soul who came to them for help. Did they lean towards the pagan? Yeah, I think so. They celebrated the seasons as much as the church holidays. Their May Day (Beltane) celebration didn’t include all the sexual rites, but…anyway. They were amazing, these sisters, and they got their gorgeous Abbey taken away from them. So sad. I think about them all the time. Terri, I think you’ve told me about that abbey. I think Sr. Catherine was very solidly Catholic, but she was also post-Vatican II Catholic. The 70s were a very exciting time, I think, for the Church and its ministers, what with all the reforms and a renewed focus on community instead of hierarchy. Unfortunately, a lot of those reforms got rolled back under John Paul II, and Benedict, of course, did not improve matters. Catholic sisters have been very important for spiritual life and service in the Church as a whole for centuries now. Important and under-appreciated, even harassed and rendered invisible. I have a lot of admiration for the work that they’ve done and continue to do.